Lucy's Quilts: More eating than sewing! Our son and his girlfriend arrived on Saturday and we have been having fun spending some time with them. She is from South Korea and has spent the past year going to school at WSU. She will be going home next week so we are trying to enjoy the time we have left before she goes. They have made dinner for us a couple of times. Here is a picture of one dinner. This is called kimbap and is not something you would find in a restaurant but is more like a sandwich. It was very tasty and I am hoping to learn how to make them as I think it would be a great dinner for hot weather. This evening is Advent soup supper at church and the kids are at ZooLights so they won't be making dinner today and I think tomorrow I will make japchae for dinner which is a Korean meal that my mother learned to make back in the 70s and when I made it for Peia (the girlfriend) for her birthday last month she said it was like at home. I am still working on the 'guy' quilt for the little princess. Just have the buttons to get sewn on. I am going very slowly since I am not a huge fan of sewing buttons on! It will get finished though! Last week I made a couple of sets of these little numbers for my two 'drinking buddies' for Christmas. 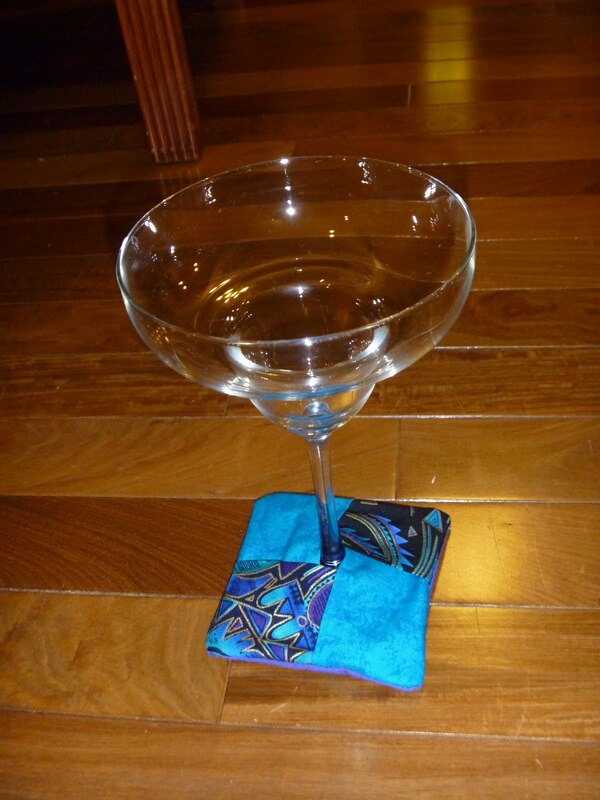 They are coasters for stemware. They also work as glass markers as long as they are all different. I made them out of scraps and just cut squares until I had 6 that sort of went together and then put them together. I plan to make more for a bazaar table at the next quilt show. Last night at craft night we didn't get any crafting done once again. Instead I brought over my birthday cake - a from scratch German Chocolate Cake - my favorite! That along with 11 batches of Chex Party Mix was yesterday's cooking project. Today I made peanut butter fudge and orange creamsicle fudge. Both are quite tasty! I am hoping to give most of it away so I don't end up eating it all. So far I haven't gained back any of the 25 pounds I have lost in 2010 and I hope I can keep it that way and then in 2011 I would love to lose another 15-25 pounds. Then I will finally have lost the baby fat - 21 or so years later!!!!! Merry Christmas to all!and to all a Good Night! Time to post or time to sew?